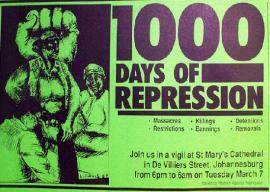 Description: This poster is an offset litho in black and green, produced by TOPS for WAR, Johannesburg. This poster announces a meeting to protest the State of Emergency. 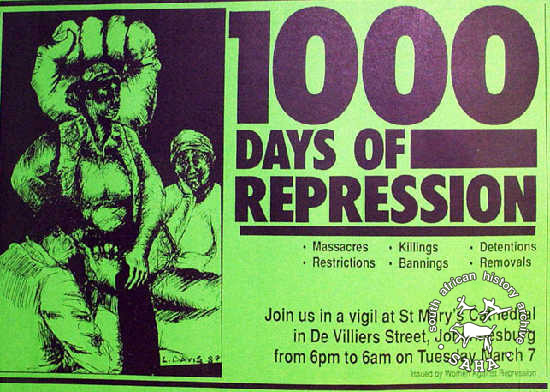 The text reads “1000 DAYS OF REPRESSION”Digitised by Specialised Archival Solutions in 2009. Reproduced in "Images of Defiance: South African Resistance posters in the 1980s" on page 140 (number 252) of the 1991 SAHA / Ravan Press edition and the 2004 SAHA / STE Publishers edition.